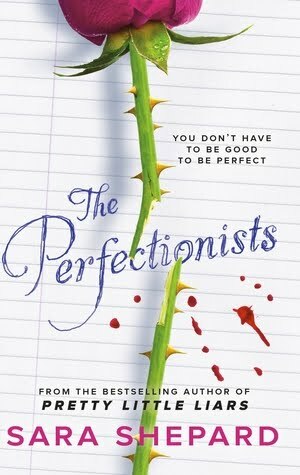 Today I will be reviewing a book that I wasn't entirely happy called The Perfectionists by Sara Shepard! This book, written by Sara Shepard, was quite honestly just a bit of a bore. The five characters were rather predictable, and the only thing remotely exciting was the back stories of each girl. The main plot however was so unbelievably predictable. Every twist and turn I saw coming from a mile away, and seemed so stereotypical. I couldn't connect with any of the characters, because I felt like their personalities had been done before - and they reminded me too much of the girls from Pretty Little Liars. Actually, now that I think about it, this entire book reminded me of Pretty Little Liars. Much like Shepard's other book, this was chock-a-block full of beautiful, but bitchy girls, cliches and cliques, rich bullies, evil adults, dark secrets and someone who is out to frame five girls - sounds very familiar. Of course, there's no issue with an author using similar ideas or themes in their books, however, I just felt like it was almost a complete remake of PLL (a series I did enjoy), with a few details changed. I also didn't understand why people in the bookacted the way that they did - and the reasons for their actions were not explained. Look, I probably can't judge this aspect so quickly, because this is the first book of the series, so maybe some of those things will be explained in another book. Some of the story lines present in the book were unbelievable, and left me thinking - 'Really? Like someone would actually do that'. Now, don't get me wrong - this wasn't the worst book that I've ever read and it was a 'nice' read because it was light and I didn't really have to think about it! As well as this, I will admit that Sara Shepard was able to expertly weave back-stories into the novel, without it becoming confusing or boring. In fact, it actually helped 'thicken the plot' of the book and it was the part of the book I liked the most. The Perfectionists was rather mediocre. There were moments where I was excited, but really I saw everything coming anyway. So, what did you think of this review? Have you read The Perfectionists? What did you think?